Wrapped in a festive package, these creamy delights will be a hit around the holidays. But save a few for yourself—you won't be able to resist! Drop by rounded teaspoonfuls onto prepared baking sheet; refrigerate for 10 to 15 minutes. 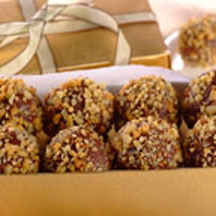 Shape into balls; roll in walnuts (or NESTLÉ® TOLL HOUSE® Baking Cocoa). Store in airtight container in refrigerator. Variation: After rolling chocolate mixture into balls, freeze for 30 to 40 minutes. Microwave 2 cups (11.5-ounce package) NESTLÉ® TOLL HOUSE® Milk Chocolate Morsels and 3 tablespoons vegetable shortening in medium, microwave-safe bowl on MEDIUM-HIGH (70%) power; stir. Microwave at additional 10 to 20-second intervals, stirring until smooth. Dip truffles into chocolate mixture; shake off excess. Place on foil-lined baking sheets. Refrigerate for 15 to 20 minutes or until set. Store in airtight container in refrigerator.